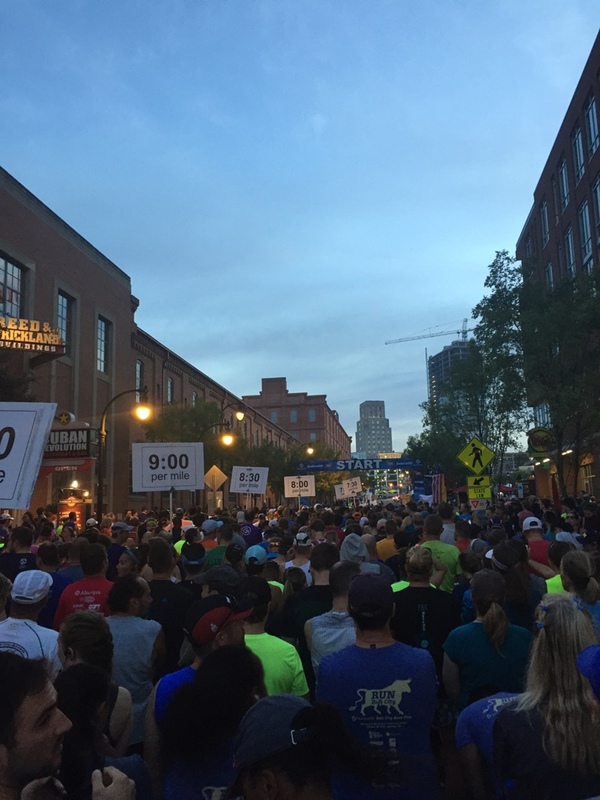 I signed up for the Bull City Half in May (I think) and more or less followed the beginner training plan in The Marathon Method by Tom Holland. If you’re looking for a book on how to train for your first half or full marathon, I highly recommend this book. 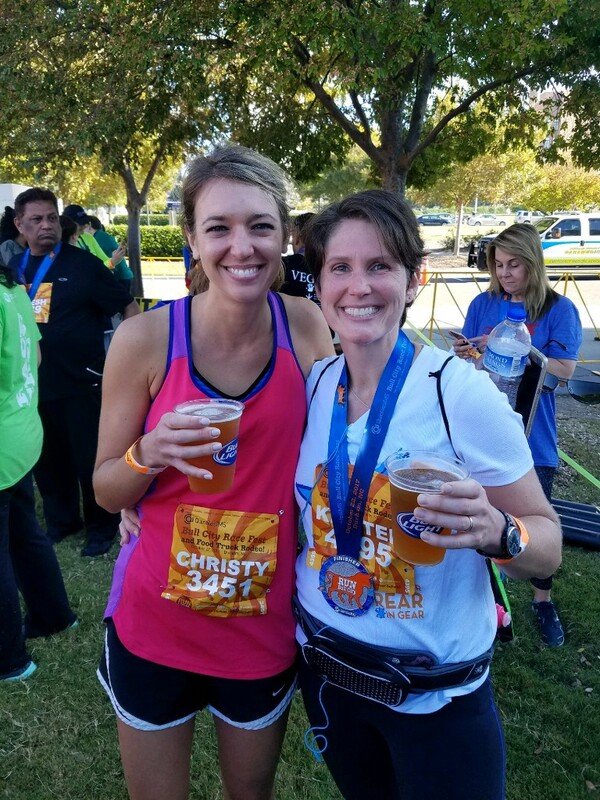 Not only does it give you detailed plans for beginner, intermediate, and advanced training for full and half marathons, but it also covers strength training, injuries, and a bunch of other topics. 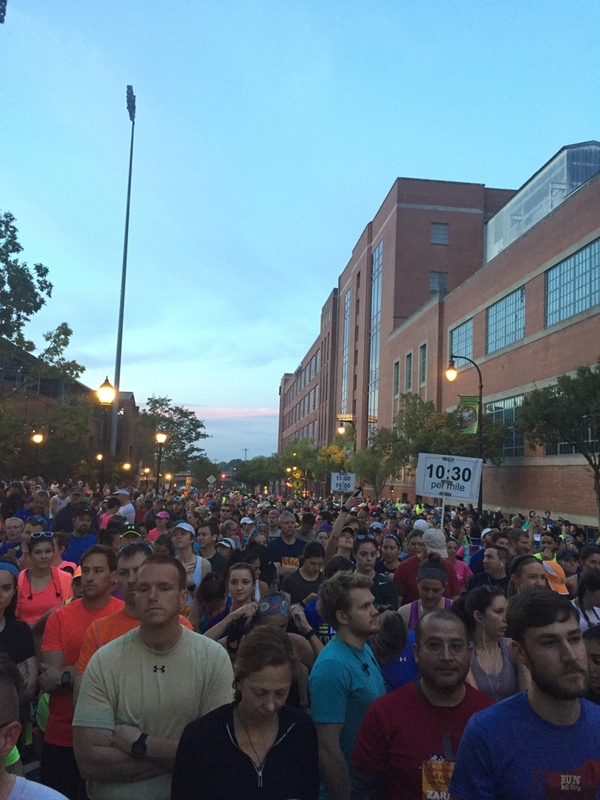 My primary goal was to finish, obviously, but my secondary goal was to finish in under 2:30. (That’s a roughly 11:50 min/mile.) A few weeks into training, my friend Emily (the one who convinced me that I could do a half marathon) also convinced me of the sanity to be found in using the “Galloway method” of run/walk splits. I did the remainder of my training running for a little over 5 minutes and then briskly walking 45 seconds to make an even 6 minute cycle. 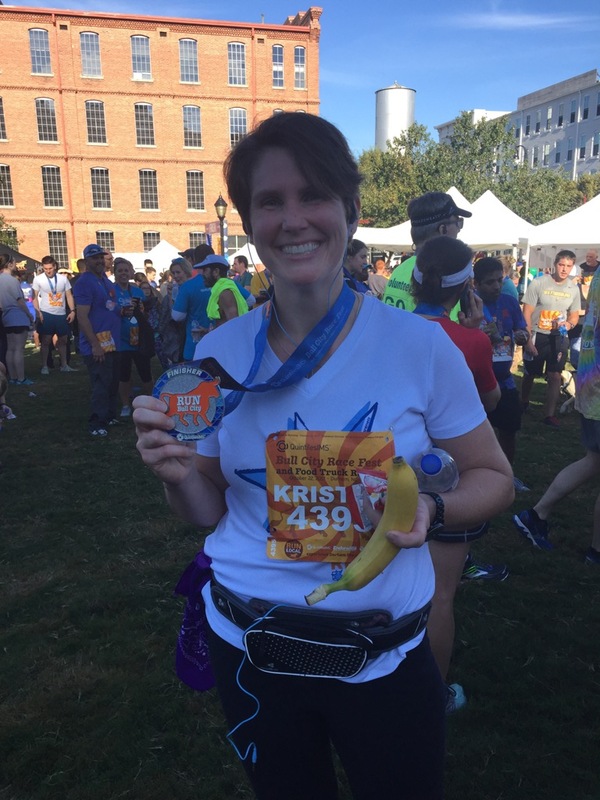 (I like round numbers…) I still have a hard time not adding the caveat “But I didn’t run the whole time, so I’m not really a runner….” to any conversation I have about running. Using the run/walk method, I averaged between 9:45 and 10:15 min/mile throughout most of my training. Unfortunately the last 2 weeks before the half were complete rest weeks for me, as DB was out of town and that means that I can’t get up and run before work like I usually do. I mean, the kids would probably be asleep the whole time I was gone but nowadays it’s pretty firmly frowned upon to leave 3 children under 6 alone in the house for extended periods of time, even if they’re sleeping. So when I went into the run last Sunday, I knew my pace wasn’t going to be quite up to speed (pun intended, ha!) but I also figured I was well rested and ready to go. And I had a really good time. The whole day was a lot of fun, from start to finish, and a totally new experience for me. 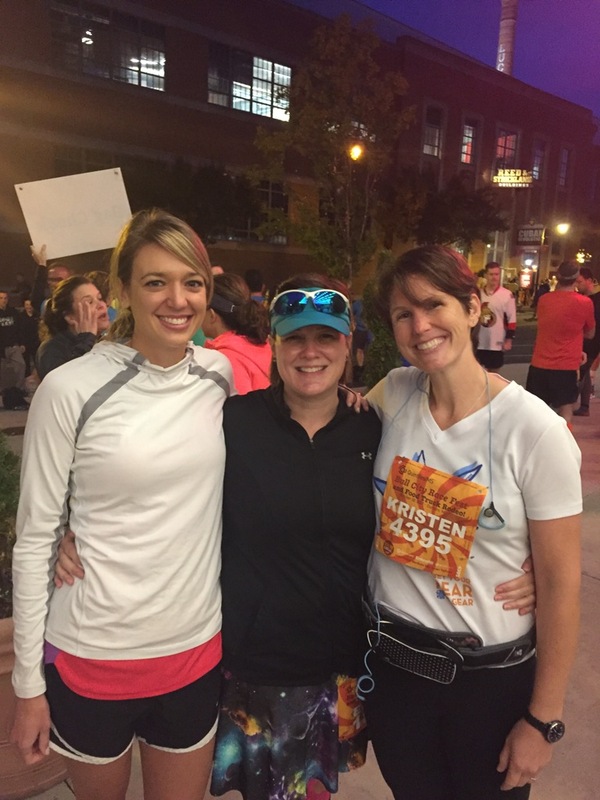 The vibe was very different than the typical 5K I run – it was a different kind of camaraderie than found at shorter races. I especially liked the fact that runners got 2 free beers from really decent breweries! And the food truck rodeo! Runner math: spend 2 1/2 hours burning 1800 calories, spend 30 minutes post-race consuming 2000 calories in beer and steamed bao. 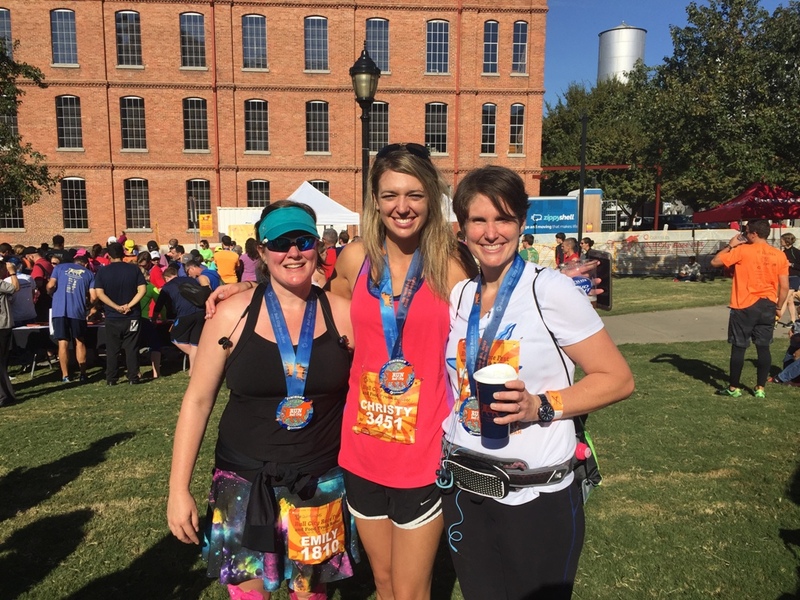 Now the only question is, what half marathon do I sign up for next? Well, and beer. Beer makes it worth it too. And no, it wasn’t Bud Light, it was craft beer in Bud Light cups. Thank God. This entry was posted in Home Life and tagged BrewsterMama, Half Marathon, Running by BrewsterMama. Bookmark the permalink. You’re so amazing! There is a gorgeous half/full that same weekend here. Maybe if I get strong enough to run we can do it together sometime!! !